Osheen was rocking dancefloors when the rest were kicking the slats. When rave came to the north-east USA in the early 90’s, Osh was already an area veteran and quickly became known as New England’s chief house rocker. His style was jacking, chuggy, and swinging, with sophistication, muscle, and lots of surprises; a vibe that made you screw up your face and dance harder than you ever thought you could. A couple of memories: peak hour at a 1993 Providence party called Casper Osh drops Sasha’s remix of Hysterix “Talk To Me” (Sasha’s best, IMO) and over the rising strings in the big break down layered the Minister of House acapella. The timing was perfect, with the acapella ending just as the track reached it’s climax, and the result was probably the most brilliant use of that much-loved but over-used anthem I’ve ever heard. Massive. In the same set he also dropped DJ Icey’s banging first record, Energy Traxx Vol. 1, which had just come out. Osheen’s signature track back in the day was Mike Dunn’s “The Pressure Cooker”, a ferocious interpretation of Cajmere’s “The Percolator”. I’ll never forget being in a crowd of thousands at a Boston party who’s title I forget (I believe it was the Primary/Liquid Todd colaboration?) when Osheen played the closing set after Derrick Carter. Though sunlight shown in from distant garage doors, the room was still very full and the vibe was electric. DC had layed down a slamming set of Chi-town business and the crowd was pumped for more (the highlight of Derrick’s set was most certainly his phenomenal collaboration with Chris Nazuka, “Am – Flying High On The Wings Of Intent”). Some time into Osheen’s set, the Police appeared on stage, harassing Osh to turn off the music; chaos was in the air. Just when we thought the authorities would shut the party down, Osh dropped The Pressure Cooker (flipping the cops off at the same time, if I remember?). The reaction was explosive; as if several thousand bodies simultaneously cheered and jumped into the air. Osheen almost always played house in those days. If you were lucky you got to hear him play one of his sick old school sets (funk, breaks, freestyle, old b-boy stuff). But what most people didn’t know was that he had great taste in trance, too, and he played it with the same jacking, swinging style that could be heard in his house sets. On a road trip to a gig he was playing he gave me this tape, Trance #7. It most likely dates to 1993. His mixtapes in those days were titled with a style and number; House #154, etc (yes, he had hundreds of mixtapes). 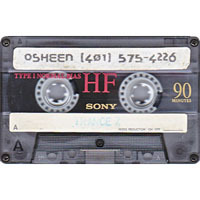 Though the title of the tape implies a trance romp from start to finish, let me reiterate that this is Osheen we’re talking about. The mix starts and ends with classic bombs easily categorized as trance, but the majority of the mix is more like dark tech-house, hard house, and tribal. I really appreciate how easily he transitions between genres while keeping the moods contiguous. Years later when I started a weekly party at The Phoenix Landing I asked Osh to come up to play a classic trance set because of this tape, and it went down as one of the best in our 7.5 year run. Even self-proclaimed trance haters couldn’t resist when Osh brought the jack. It was a huge night and everyone went home sweaty and hoarse from cheering. Looks like Osh is still rocking it, BTW. Must be about 25 years behind the decks. You can hear new mixes on his podcast, here. LOVE IT! Thanks for sharing. You brought me back! I still have this tape! Copied it from Shannon after he got it from Osheen. Definitely one of the best trance mixes from that era. The track with the Bob Marley vocal sample still gives me chills. Would love to know what the name is of the track that seems to begin at 56:21. Thanks for providing all this content, brings back some very good memories. That party where he played after carter was Vinyl. Listening to this again and am so, so, so hot up on it. GOD DAMNNNNN! It's good.